I see a weird status of the upgrade-message in a MLF-based forum. 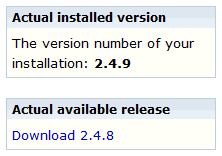 The text in the box states, that I can download the version 2.4.8 even the box above states, that the newer version 2.4.9 is installed. In my own forum on projekt-mlf.de the messages are correct because I didn't perform the update. The wrong message is no showstopper, nevertheless I'm curious why this happens.